Everyone knows what a serious firearms instructor looks like: bald or shaven head, dark sunglasses, 5.11 pants, black or tan polo shirt. Pictures of these guys all look alike, with shadowy backgrounds and high-contrast mood lighting (yeah, so about those sunglasses, guys…). Almost a Men in Black look, only without the suit. Well, I’m setting out to change that. 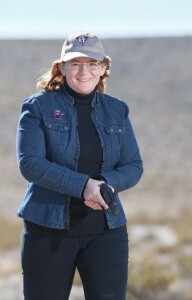 I am a serious firearms instructor, but I can’t manage that look. Nor do I want to! For one thing, I have hair and really intend to keep it. For another, I specialize in realistic training for realistic people. It’s not about how badazz you look; it’s about being competent with a simple tool designed to help you save your life. It’s about being prepared to handle whatever life throws at you in a very practical way. It’s about keeping the life you already have, not about becoming someone else entirely. So here’s the look I’m after: competent, realistic, practical, professional. If I can manage “feminine” while I’m at it, I’ll take that. I love Oleg’s work. But what do you think — did I meet my goal? Great look Kathy!! Honestly, I think most folks that take training see through the “garb” in the first few minutes. They are looking for an instructor really willing to teach – not just talk. Nothing to do with the uniform. My personal bug-a-boo with trainers is that they don’t smile, don’t engage. I’ve taken more training from hardasses than I care to remember – and it’s no better than a truly engaged instructor. So, for me, I do the 5.11, black polo with short hair (of course, mother nature is really helping me on that one! 🙂 ) but I do my best to act like a real human in the classroom and on the range. It’s not what you look like, it’s how well you TEACH! And your look is MUCH better than a lot I see! That is the truth. 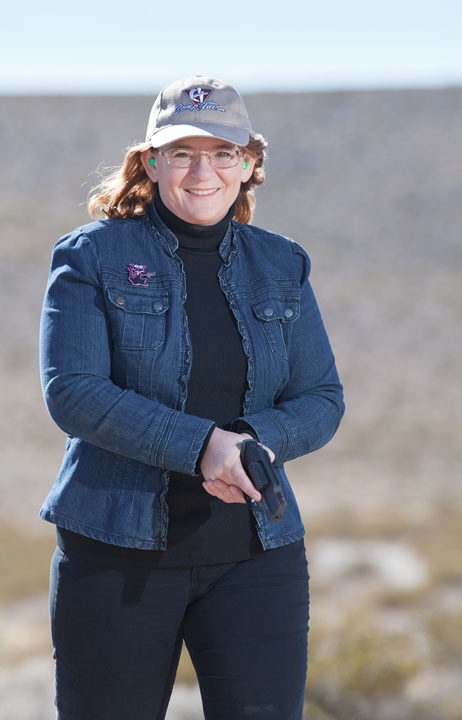 When I go to the range I dress comfortably. I try to wear something unexpected, like a pink hat or a colorful warm scarf. I am a female, I refuse looking like Rambo. I think you look like someone who knows what they are doing. Works for me. I would take you seriously and listen but then again I figure you know more than me so I’m instantly going to be all ears. wkeller said something about trainers doing a lot of talking, so far other than my friend teaching me stuff I’ve had one class and I feel I paid the guy to tell me stories more than I did for information that would be helpful. One other thing, your appearance is inviting, I would instantly feel comfortable and at ease to ask questions no matter what the questions would be. I do use a vest with pockets big enough to hold my fake gun, a BandAid kit for thumb-behind-the-slide, target scoring pen, and a stapler. I like it! I admit, I wear the 5.11s and polo but I smile, I laugh with students and try to make the classes fun for all of us. I can’t wait to take one of your classes, I love your personality and humor and know it will be wonderful! How on earth have I been around and yet have failed to register on this site? Depending on my mood, I teach in either 5.11s or jeans. Now that I have my fancy polos from SHOT, I’ll be wearing those when I teach. I try to have fun with my classes and keep them involved in a conversation rather than lecture during the classroom portion.